Developer/Publisher: Backbone Entertainment / Capcom U.S.A.
Super Street Fighter II Turbo HD Remix is the most recent rendition of the longstanding Street Fighter II brand from Capcom. For those who feel the need to get caught up to speed with the branding, Street Fighter II has been around in some form or another since 1991, when it took the gaming arcades by storm. Street Fighter II took competitive gaming to an entirely new level; the characters in this new fighting game were varied, balanced in their focuses of skill, and highly detailed (for the time) in their hand-drawn appearance. The intensely competitive game became an instant classic and spawned more modifications, rereleases, updates, and semi-sequels than I care to count. Each release tweaked the battle system, character selection, character balances and attacks, color palettes, and many other (sometimes) subtle modifications. Which brings us to HD Remix. This release spent quite some time in development and refinement in order to become the definitive version of Street Fighter II. With completely redrawn (high resolution) character art, totally rebalanced characters, all 17 characters seen previously, a fresh soundtrack from the great people over at Overclocked Remix, online play, and the ability to play with all of the original arcade settings (balancing, visuals, and sound) for longtime fans. So, without further adieu, let\'s look at what makes this fighting game so significant. As a rule of thumb, fighting games survive on their gameplay above all other factors. Because of that, let\'s take a look at the fighting engine within HD Remix. For those of you who have never experienced a Street Fighter game, we\'ll start from absolute ground zero. 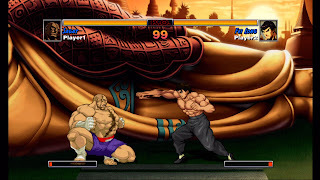 Street Fighter pits two players against each other in an all-out martial arts fight with attacks ranging from simple punches and kicks to spinning grappling moves to fireball throwing, and anything in between. 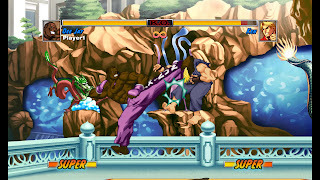 Attacks are employed via three punch and three kick buttons (that is, three levels of attack strength), combined with directional inputs on the pad or stick. Various motions on the control stick combined with certain attack buttons allow players to use special moves (such as the fireball). And so the basic controls work. It sounds simple on screen, but unlike most modern fighters, Street Fighter doesn\'t reward you for just hitting buttons rapidly while hoping for the best. The gameplay is in no way about having the flashiest special moves or the most devastating attacks. No. The gameplay is all about being able to read your opponent, planning and reacting with speed matching that of blind instinct. Indeed, the game is designed so that you will need to practice and improve in order to succeed in competition with other gamers. Fortunately, Street Fighter II (even with all of the upgrades of HD Remix) has never been about expansive move lists. Each character has a fairly intuitive basic attack arsenal and a few easily remembered special moves. Thankfully, most of the characters are extremely diverse not only in how they were designed to be played, but also in how they can be played. Ryu, for example, has quick strikes and ranged (fireball) attacks. Zangief, on the other hand, has slow attacks without a lot of range, but he is a brutal grappler when played close to an opponent. And so on with the other fifteen characters. Fortunately, especially in light of the adjustments made in HD Remix\'s character balancing, no character has a built-in advantage over another; this further drives the focus of the game on the player instead of the player\'s character decision. For all that HD Remix does do right in gameplay terms, it does lack in one aspect. The game is designed through and through with multiplayer in mind. The single-player experience is limited to an arcade mode that simply challenges you to a dozen fights followed by a brief victory story and a very simple training mode. The arcade mode can be fun for a little while, and it can very much provide a challenge, but it really isn\'t the intended experience at all. The training mode is useful only for mastering the timing of special moves and working on new combos. But the good news is that the single-player probably isn\'t why you would want to pick up HD Remix in the first place. Nope. The multiplayer is where your time will be spent, and it will be time well spent. The local multiplayer provides that personal touch that playing in an arcade years ago did. The online multiplayer (where most of us who lack fighting game fans among our friends) is phenomenal for a fighter. You are not given a host of different online modes (limited to ranked, unranked, and tournament matches), but the execution is nearly flawless. Even on a slower connection like mine, lag is hardly ever an issue. Add in voice chat, and this is probably the closest thing to the arcade experience we in America will ever see again. As an added bonus, Capcom took seriously the "HD" part of HD Remix. Graphically, the game flies in the face of today\'s highly realistic 3D models by sticking to hand drawn sprites. HD Remix has retained all of its original style, but it now carries with it fully redrawn images crafted in high resolutions. Longtime fans should be thrilled by this faithfulness to the source material. However, newcomers will likely notice quickly that character animations are not very fluid. In other words, there are not a great number of frames within the animations. To be fair, this couldn\'t be changed without changing the entire fighting system (as the frames are directly linked to the points of contact for the fighters). On a positive note, the graphical effects that were added, limited in number as they are, are actually rather good looking. For instance, the fireballs have a nice glow about them. Also nice is that Capcom ran with the "Remix" part of the name, too. In a move that could be considered bold, Capcom outsourced the music creation of HD Remix to the popular community for video game music remixes, Overclocked Remix. What we have here is a soundtrack that keeps much of the vibe of the original games while bringing in some modern flair in addition to greatly improving the actual sound quality. Granted, most of the time spent in fights will be so focused on the fight itself that the music will not be easy to really appreciate or enjoy; however, some tracks (especially the main theme) ooze with that drive found in early 90s video games. Even now I have the main theme stuck in my head, and I have no complaints whatsoever about that. The sound effects, however, don\'t carry a great deal of life with them. Simple voice samples are used when executing special moves and at the end of fights (just like in earlier versions). Sound effects made during strikes are functional, but nothing to write home about. Understandably, the violent nature of HD Remix may keep it out of the hands of kids, but it is not really a game that will appeal to most kids due to its highly technical nature, anyway. And, on the whole, HD Remix is a very solid package. The challenge is that it simply will not appeal to everyone. In all reality, only a rather select audience will truly enjoy and appreciate this game. Then again, even after a decade and a half since its first form, Street Fighter II can still hold its own against the Soul Caliburs and Dead or Alives of today. When push comes to shove, few fighters can come close to matching the rock solid engine found in HD Remix. For fans of fighting games, as well as competitive games that are not called "Halo," it\'s fairly easy to recommend spending $15 on this one.